Outfit your desk in your style. For the best experience, choose the solid wood top that assimilates into and complements your office style. We're proud to offer you a broad selection of desktops in a variety of hardwood species, each with its own spectacular wood grain and bark patterns, handcrafted to bring out the best features in each type of wood. Our 80 inch pheasantwood desktop features elegant barkline edges in two options: barkline on the front only with grommets, and dual barkline without grommets. This rustic detail lets you bring a little slice of nature into any space. Our expert woodworkers were chosen for their years of experience with these hardwoods, so you get unparalleled attention to detail without the wait. Each desktop is handmade ahead of time and kept in stock until it's ready to ship to you. Design the desk you've always dreamed of, with the beauty of genuine wood, by purchasing a handcrafted quick ship solid wood top from UPLIFT Desk. Note: Due to the unique characteristics found in genuine hardwood, your finish may vary slightly from what is pictured. To keep your solid wood top looking its best, we offer expert wood desktop care and repair instructions. Our Quick Ship desks come in many different widths and lengths to fit your unique office space. We advise picking a desktop size that suits your space and needs. As each desktop is 100% unique, you should expect the possibility of some black wood filler appearing in our pheasantwood desktops. Here is an example of what one might receive. You've found them! Our most luxurious standing desks have always been those with custom solid wood desktops, and now you can enjoy the beauty of natural hardwood in a variety of options, kept in stock and ready to ship to you! UPLIFT Desk is here to craft you an heirloom-quality piece of furniture with hues and grain patterns unique to your choice of wood species. Height adjustable desks are becoming ever more popular thanks to their positive impact on employee satisfaction, productivity, and health. UPLIFT Desk was built to promote healthier work with these benefits in mind. To help keep your body and mind active at work, we've built the desks that are consistently recognized as the highest quality, most versatile, and most stable height adjustable desks available. Invest in your health, well-being, and fine taste in decor with a beautiful solid wood desk. Authenticity is our credo for UPLIFT Desks. While some manufacturers will stain maple wood to imitate the color of other wood species, monochromatic varnish can't compete with the rich natural coloration of real exotic hardwoods, and the distinctive patterns the wood grain naturally provides. Our hardwood selection includes Acacia, Ash, Walnut, radiant red-hued African Mahogany, and Pheasantwood, named for its natural resemblance to the black and golden figured patterns of a pheasant's tail feathers. These heavyweight desktops are 1.75" thick, a whole quarter inch thicker than most solid wood furniture. Our attention to real craftsmanship doesn't stop at the surface. Even the underside of your desktop is built to ensure your desk will stand the test of time. Our built-in support system is there for you, with steel support bars running underneath the desktop to prevent relative humidity from expanding or contracting the wood, which can cause cracked or warped desktops. The wood even includes built-in inserts threaded to fit our hardware, for easy assembly with no drilling. At the end of the day, our team is dedicated to the utmost in quality, ensuring you receive heirloom quality furniture you and your family can enjoy for many years. Need a size or cut you don’t see? We also offer custom solid wood desktops in unique styles that are made to order. Transition quickly from sitting to standing so you can keep your concentration. All configurations of UPLIFT Desks use three-stage frames, for better performance than the two-stage models found elsewhere. Our frames feature 33% faster raising and lowering and are fully height adjustable from 24.4" to 50.0" (without desktop thickness). Our solid wood desktops are 1.75" thick. Our 3-stage columns offer 25.6" (650mm) of vertical travel, to accommodate more users in ergonomically correct comfort. Our dual motor design ensures your desk is strong enough to raise and lower with a full desktop. With a 355 lb weight limit, your dual monitor setup, desk plants, collectible figurines, picture frames, laptop, phone, tablet, and coffee cup on top won't pose a problem. If you’re in need of even stronger support, our 3- and 4-leg frames lift up to 535 lbs. Not only are three-stage, dual motor frames more reliable than a single motor option, at a whisper-quiet 46 dB when adjusting, they won't disturb your colleagues either. Our built-in safety features are designed to protect you from bruised fingers and broken valuables. The anti-collision sensor built into all of our frames and control boxes detects resistance in mere fractions of a second, and stops and reverses direction a short distance to prevent accidents or injury. You can also turn on the keypad lock to keep your desk from moving up and down. It's perfect if you’ve got children pressing all the buttons - or nosy coworkers. Your frames are also completely protected. If anything at all doesn't behave as it should, just give us a call and we’ll make things right. Our seven-year warranty comes standard, and covers all your frame components, mechanical or electrical. You can even upgrade to an extended 12-year warranty. Work at the right height with just the push of a button. Choose the Advanced Digital Memory Keypad to store up to four preferred desk heights in memory, so you can sit, stand, perch, balance, or even walk in comfort. The onboard digital display will show you the current height, in inches or centimeters. To return the desk to a stored height, simply press one of the numerical buttons. You’ll never be stuck trying to remember where to find that perfect level from the other day. Prefer simplicity? Stick with the standard two-button electric keypad included with the desk, and you can electronically adjust your height by holding the easy up and down buttons. Get a bigger boost to your health with active standing accessories that encourage frequent motion - on us! Standing mats and motion boards cushion and activate your standing desk experience. Select a free or discounted gift from an assortment of accessories designed to defend your feet from aches and fatigue by facilitating easy motion. Enjoy greater comfort and less wrist strain with ergonomic accessories to provide the finishing touches to your UPLIFT Desk. Bring your typing setup closer and relieve strain on your shoulders with a keyboard tray. Keep your office supplies in easy reach with a free gift organizer set, then give yourself even more convenient storage for pens, pencils, highlighters, sticky notes, and other small items with available desk drawers. CPU holders mount conveniently under your desk to allow easy access to ports and peripherals. Manage wire clutter with available grommets built into your desktop, or choose an upgraded wire management and power solution for an even cleaner look. Don't stop at your workstation; we have all the tools you need to create your most comfortable active office. eep your back and legs properly aligned to prevent strain and pain with a footrest and a properly configured chair or stool. Proper lighting reduces eyestrain. Work off energy at your desk with a treadmill or bike. Stay focused with acoustic panels that filter out distracting background noise. To ensure that not just we, but all future generations can enjoy the beauty of natural solid wood, we partner with the National Forest Foundation and the Trees for Us program to contribute to conservation efforts. For every Standing Desk with Solid Wood Top and custom made solid wood desktop we sell, we plant five new trees in U.S. National Forests through this partner program. This conservation partnership is just one of the many ways we're committed to building an environmentally sustainable company. For other sustainable desktops, check out our bamboo, rubberwood, and reclaimed wood desks. It's a completely natural process, but it's unfortunately something that could affect your new wood desktop. If your desktop does crack or split, we're happy to send you a repair kit to fill the affected areas. If potentially repairing your wood desktop isn't something you're comfortable with, we recommend that you take a look at our Bamboo, Eco Curve, or Laminate desktops instead. 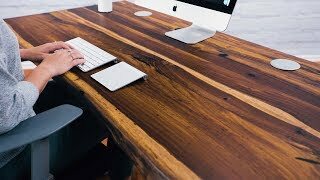 Which woods are available for quick-ship desks? The UPLIFT V2 Solid Wood Ergonomic Desk is stocked in a variety of exotic hardwood species, including pheasantwood, African mahogany, walnut, ash, and acacia. African mahogany is a real mahogany that comes from the Meliaceae family of trees. It is a deep red-tinted hue, as compared to the browner tint of Honduran mahogany. What kind of wood is pheasantwood? Pheasantwood is a rare wood characterized by a natural pattern that features contrasting gold and brown coloration. It takes its name from its similarity to the black-and-golden figured patterns of a pheasant's tail feathers. Pheasantwood can be sanded to a luminous reflective surface. Note that pheasantwood is naturally uneven; you may see the use of black filler in your top to help create the smoothest surface possible. What are the barkline options for the pheasantwood desktop? All sizes offered are available with a front barkline. The 80" W x 30" D size is also available with a dual barkline. To choose this option, be sure to indicate "no grommets" as you make your selections. If I order my desk now, when can I expect to get it? These solid wood desks are kept in stock and ship either the same day or the next business day. They will typically reach you 4 - 6 business days after they ship (if you are located in the 48 contiguous United States). What kind of keypad comes with this desk? This desk includes a standard two-button push-and-hold up/down keypad. You can upgrade to the Advanced Keypad, which allows you to store up to four different height settings in memory and reach your perfect height with the touch of a button. Why is there a motor in each desk leg? All UPLIFT Desks are built with a motor in each leg to ensure that your desk is safer, quieter, stronger, and more reliable than any other desk available. Other electric standing desks on the market use only one motor for the whole frame mechanism, so they lack the weight capacity and durability of our three-stage frames. Some UPLIFT Desks have the option to add wire management grommets. Do these? Grommets come standard on all size options for stock solid wood desktops. For an option without grommets, you will need the 80" x 30" desktop, or a custom solid wood desktop. Is your solid wood reclaimed wood? These solid wood desktops are made to order and handcrafted by our expert woodworkers. If you're interested in a reclaimed wood desktop, the UPLIFT V2 Reclaimed Wood Sit-Stand Desk is a great option. These desktops are built using salvaged wood, yielding a beautiful desktop without cutting down new trees. If you're concerned about the environment but have your heart set on the luxury of solid wood, remember that for every solid wood desktop we sell, we plant five trees in U.S. national forests, through our partnership with the National Forest Foundation. What are the advantages of a three-stage frame? UPLIFT Desk frames have three stages, as opposed to the more common two-stage desk frames, so that they raise and lower 33% faster. This design also gives you a broader adjustability range, enabling UPLIFT Desks to fit a wider variety of people, including everyone from the very petite (including children) to the very tall. Which control box do I have on my desk? Take a glance at the silver label affixed to your control box. If the label says v4.1, v4.2, or v4.3, you have a version 4 control box, which comes with new features! What new features come on the version 4 control box?? The new version 4 control box comes with a host of new safety features. The more advanced collision sensitivity stops your desk when it touches an object. Activate the child lock on the Advanced Keypad to prevent changes to your desk height, which is perfect for work areas where kids might be around. The Advanced Keypad also switches quickly between one-touch and constant-touch modes, and can easily be configured to display heights in inches or centimeters. Desk itself arrived via Fedex very quickly in couple of days. Was very easy to assemble. The motor to raise the desk is very quiet and the built is very sturdy and doesn't wobble or rock even at 43". I am really enjoying my new desk. The UpLift 900 desk is amazing. I got it with the solid walnut top, and it is very classy looking, yet has a definite modern appeal with the powered height adjustment and streamlined legs. I really like the memory functions on the control and have preset heights for chair, swopper stool, and standing options. I purchased this desk because of the "ship next day" option. The staff were very accommodating in getting it sent right away, and dealing with a problem with a local white glove delivery service. I love the desk and wouldn't hesitate to purchase again. We offer a 30-day trial on all single-item UPLIFT Desk brand orders, with the exception of custom solid wood and custom laminate desktops. If for any reason you're not satisfied, return the item with no outbound shipping or restocking fees. $1,119.00 List Price: $1,699.00* The list price is the same as the MSRP (Manufacturer's Suggested Retail Price). It may not necessarily be the price at which the product is sold.